I just fell in love with a new cookbook. I'm quite frivolous when it comes to cookbooks, and have yet to be able to name a month where I haven't taken a new one home. True, I am not loyal to each and every one of them at all times, but I find myself remembering an old flame a couple months down the road and browsing its pages with immense pleasure. While I have not tried nearly as many recipes as I would want from each and every book, just flipping through the pages is a constant source of inspiration. This new cookbook is a real keeper. It's the Baked Cookbook, from a bakery in Brooklyn and I fell in love with it as soon as I saw the cover. Yes... I do judge on appearances! These muffins were the first recipe I tried from the book. They worked out wonderfully because I had been saving a couple bananas for weeks. The thing with bananas is that they really get sweeter as they ripen. When the skin gets really dark brown and the banana really soft, you know it will give you the most delicious base for banana bread or in this case.. banana chocolate muffins! I also chopped the chocolates into coarse pieces instead of using chocolate chips which added a nice rustic look to the final product. I loved your first paragraph...you could be talking about me! And I've heard great things about this book, so I'm going to look for it. I have heard great things about this book - I need it! Those muffins look good! I really like baking with bananas and adding chocolate makes it even better. thanks for the recipe! I cant resist a recipe with all my favorite ingredients in it! I will be making these soon! I have heard about this cookbook elsewhere but you endorsing it is the sign I need to actually buy it. Love your blog. chocolate, bananas, and espresso...now those are 3 things guaranteed to get me going in the mornings!! Oh my. These are like three of my favorite things all in one muffin . . . doubled. Wow. I'll have to check the book out. I really need to buy this book! the muffins look fantastic! Looks good - how can anyone say no to this? Really?!?! What a great morning treat!! question - I love this combination you have come up with, however my husband does not eat cake with bannana in it.... have you tried this receipe with another fruit ie pear etc? yum! How espresso-y do they taste? A great combo. don't you love how the term double-chocolate is becoming more and more commonplace? The way it should be. Do I really have to say how absolutely fabulous these little gems are? I mean the pics clearly speak for themselves. this makes the best breakfast with a nice hot cup of americano. superb! 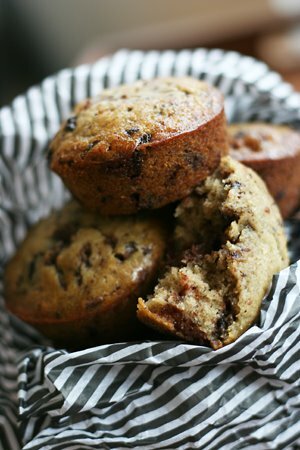 Erika: the bananas mostly give a moist texture to the muffins but are really part of the batter. You would have to try it with a fruit that has a soft texture like bananas do. Pears wouls probably not mix with the rest of the ingredients as well..
Maggie: the espresso complements the chocolate really well, and adds a nice coffee hint. Let me know if you get a chance to try these! Just the name is enough to get me going, they look fantastic! I just got that book. It IS wonderful. So many things that just catch your eye that you HAVE to make. I have this book on hold from the library- glad to hear you've liked it so far. I love the texture of whatever you've laid under the muffins. Beautiful! Oh my gosh this looks really good. I love bananas and chocolate, and I would probably eat these with coffee. But what a great idea to add them into it! What a delicious photo. And yet another reason to finally buy that book! Is that espresso in liquid form or powder form?